What is another word for related? 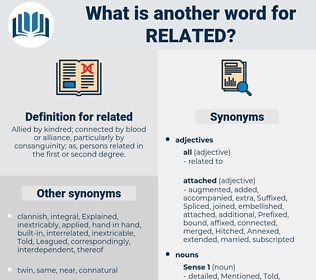 Allied by kindred; connected by blood or alliance, particularly by consanguinity; as, persons related in the first or second degree. interrelated, correlated, inter-related, unrelated, geotextile-related, nuclear-related, resource-related, trade-related, travel-related, work-related, drug-related, patent-related, threat-related, investment-related. interlinked, associated, relevant, inter-linked, pfos-related, Assimilated, relations, pertain, interconnected, tobacco-related, afferent, akin, appointment-related, dependent, germane, concomitant, tied, interdependent, resultant, treatment-related, relative, tuna-like, analogous, interwoven, regarding, concerning, consequent, Subordinated, adjacent, cognate, derived, job-related, affected, age-related, parallel, assorted, derivative, inherent, corresponding. responsibilities, associated, requirements, Las, amendments, linked, aspects, reporters, rules, neighbors, lies, relevant, locations, members, data, priorities, Rights, annexes, processes, benefits, commitments, discuss, Persons, CRS, calls, phones, women, tied, relative, Relatives, regarding, concerning, corresponding. regulating, Attributed, reflected, concentrated, Participated, revealed, Generated, allocated, addressed, promulgated, Wrote, represented, Corresponded, Resulted, Contributed, respected, interfaced, Told, respondent, Encompassed, stressed, Adhered, liaise, Compared, Arose, gate, bore, recognized, emphasized, entail, noted, applied, Applying, partnered, Rendered, recounted, rapporteur, described, Linking, Mentioned, Assessed, devoted, Expenditures, Encountered, contained, stated, enable, considered, contacts, contacted, Establishing, determined, Belonged, Dealt, per, Wore, communication, touch, touched, touches, led, presented, tained, Consisted, Earmarked, Ranged, Refused, engaged, conferred, lay, Commented, Enshrined, endorsed, spoke, left, requested, reason, reasoned, invested, Depended, centred, operandi, listed, earned, Fetched, Filed, owed, fell, projected, favour, Carried, Incurred, Occurred, Submitted, received, Benefited, Was, Were, marked, Envisaged, used, said, Brought, allow, called, Took, spending, spent, Accounted, bonded, set, conducted, Asked, focussed, status, pointed, Came, view, Viewed, joined, posed, Had, Provided, Meant, processing, Amounted, Caused, held, showed, put, hooked, guys, Looked, expenses, designed, sought, based, needed, found, Did, Went, made, Las, linked, aspects, relevant, calls, connected, tied, regarding, concerning, derived, affected, inherent, corresponding. regulated, incorporated, Attributed, reflected, calculated, Participated, demonstrated, characterized, Indicated, coordinated, circulated, Generated, implicated, Equated, allocated, initiated, accumulated, realized, addressed, intertwined, Regarded, located, contaminated, formulated, Culminated, interpreted, Collated, represented, Corresponded, dictated, situated, Resulted, restricted, Contributed, treated, estimated, traced, Explained, respected, obligated, implemented, Predicated, interfaced, distributed, criminalized, Told, learned, mediated, Transferred, triggered, harmonized, Administered, completed, correspondence, Created, Arisen, Compared, arrested, Borne, Entailed, perceived, authorized, measured, recognized, noted, enforceable, documentation, registered, favourable, applied, adapted, partnered, operations, constrained, terrorists, adjusted, Recruited, recounted, complemented, handled, specialised, indicators, rapporteur, described, subscribed, technologies, renewed, accepted, acquainted, Mentioned, routed, accrued, removed, invited, tabled, executed, Assessed, devoted, Encountered, transmitted, contained, stated, competitiveness, Reached, considered, contacted, determined, embodied, Undertaken, Comprised, Dealt, structured, indivisible, warranted, fastened, committees, agreed, Influenced, Resided, arranged, worn, Consulted, organised, Introduced, implied, granted, touched, Returned, assigned, led, entrenched, disclosed, coherence, Enacted, presented, Consisted, Opportunities, practices, Entered, organization, Trafficking, Earmarked, taped, heard, items, foreseen, engaged, geared, specified, Enshrined, organized, spoken, improved, provoked, reviewed, oriented, left, experienced, requested, inscribed, reduced, Invoked, permitted, drawn, broadcast, trained, protected, briefings, reasoned, invested, pairs, Depended, networked, financed, e.g., centred, effects, prepared, wired, listed, earned, Offered, laid, Subjected, Filed, population, exposed, justified, enhanced, Remained, charged, embedded, owed, prescribed, Achieved, statement, documented, projected, placed, Carried, Bridged, Incurred, Deployed, Detained, postponed, Submitted, aligned, weapons, Borrowed, adopted, knit, received, stuck, rooted, lost, printed, maintained, grouped, marked, entwined, Lodged, coupled, guided, used, Performed, Exercised, facility, changed, changes, Allowed, said, excellence, defined, Discussed, Brought, pursued, taken, developed, faced, advanced, role, Children, called, equipment, member, Met, spending, spent, Accounted, bonded, keyed, conditioned, shaped, HIT, licence, set, imposed, conducted, enmeshed, conjoined, Obtained, produced, Asked, focussed, destined, known, view, Viewed, expended, joined, Awarded, suited, Served, APP, posed, Had, induced, given, Occasioned, Mapped, Provided, Grounded, bounded, Meant, seen, built, fight, Claimed, Shown, Caused, held, Pegged, secured, owned, put, driven, hooked, avian, S, Died, acting, Programs, fee, signed, backed, Gained, M, kept, Looked, designed, sought, based, 19, run, needed, found, done, body, funded, founded, interlinked, 15, made, linked, aspects, connected, relations, interconnected, tied, interdependent, analogous, concerning, derived, affected. relevant, deal, bear, arise, attach, focus. relatifs, Treaties, applies, considers, deals, concerns, describes, requires, expects, Focuses, continues, Comes, provides, needs, relevant, processes, regarding, concerning. disconnected, separate, alien, Disassociated, different, inappropriate, irrelevant, dissimilar, unsuitable, foreign, unalike, unlike. And I related how Mr. Allen had come to the Hall, and what I had said to him, and how he had behaved. It was difficult to believe any of those four young Caradocs related. related to, rhyolite, roulette, rule out, reality, roiled, reallot, roulade, realty, ruled, railhead, riled, Rurality, roll out, relate, rallidae, reload, rolled, royalty.